Forget that suction cup Garfield in your car window, there’s a new animal car accessory in town and it’s Hitch Critters. These animals hitch a ride on your vehicle’s trailer hitch, giving it personality to what is otherwise just a boring nub (that’s what she said). But these animals do more than just sit there, they plug in and do little tricks when you brake. The Bad Dog shakes when you brake, the Wheelie Hog does a wheelie, the Black Widow lights up and moves it’s legs and ever popular Don’t Stop Deer raises his hands in surrender while a red target flashes on his chest. Awesome. 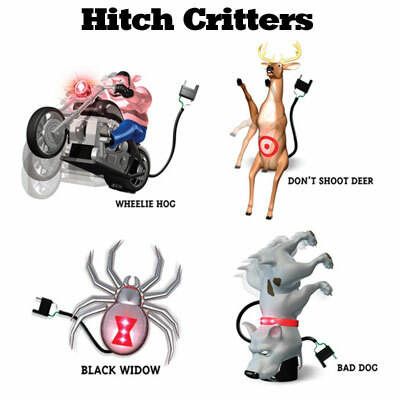 I want to order a hitch critter but can’t figure out how to do so. Please advise. How do I BUY “MAN TRAPPED IN VENT”? WHERE do I BUY “MAN TRAPPED IN VENT”?